I love bridal shrugs. Jacket, bolero, shrug, wrap - all are gorgeous accent pieces that serves so many purposes. For brides getting married in the fall or winter, a soft (faux) fur jacket can keep you warm all day. In summer, a delicate beaded shrug can cover bare arms during the church ceremony. Anytime of the year, a sparkling bolero can add that personal flair to any wedding dress. 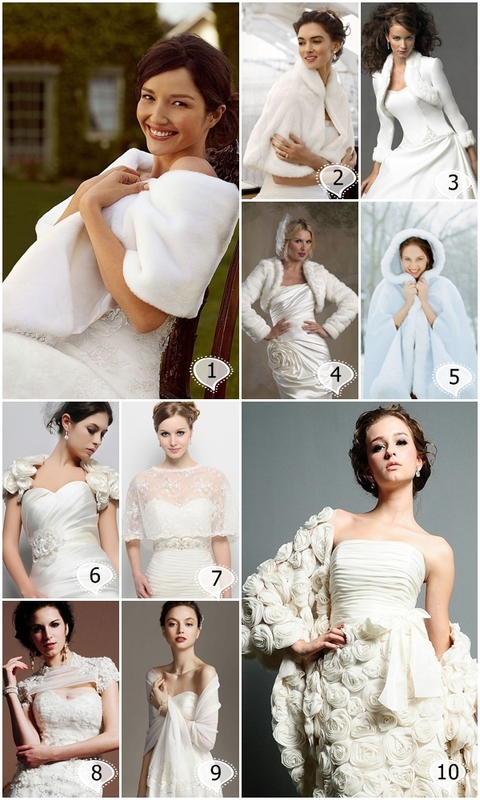 Here are some of my personal picks of capes, wraps and shrugs which are great items for brides. Check our previous post on Lace Bolero Jackets! Hi, Great post, thank you, I like your theme also! cultured freshwater pearl are needed for every girl. We provide the most fashionable pearl necklace with pendant with different color and different size. You can pick out a fresh water pearl earrings suitable for you. What's more, our mother of pearl bracelet all have very beautiful color that you will like. And you can select quality and a fast shipment. If you are fond of fashion and charm, you can not miss.